In military jargon “collateral damage” describes incidental death, maiming, or damage inflicted on an unintended target during a legitimate military attack. But last evening’s scorching performance of Fallujah by the New York City Opera demonstrated that sometimes the impact is not limited by physical proximity. 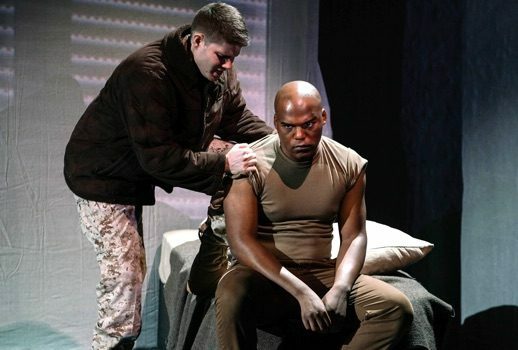 This chamber opera, inspired by US Marine Christian Ellis’s experiences in Iraq, tells the story of Lance Corporal Philip Houston and his struggle with post-traumatic stress disorder (PTSD). We meet Philip in a Veteran’s Hospital, after his third suicide attempt. The opera unfolds over a 72 hour-period, via flashbacks that reveal the nightmares that haunt Phillip – especially his encounter with a young Iraqi boy named Wissam. The anonymity in using the terms “collateral damage” and “troops” helps to distance us from the harsher realities of war. But librettist Heather Raffo, in her taut and unflinching libretto never lets us forget that these are real people and not just statistics. Names are repeated with an almost obsessive compulsiveness. And while the brutality of the subject matter might invite a comparably blunt score, composer Tobin Stokes’s vocal writing gravitates toward lyricism over declamation. Textual and musical motifs return often: a sterile, eerily calm theme that introduces each return to the hospital setting, and very effectively in Philip’s PTSD episodes, where the use of the full chamber orchestra and soloists overlap to portray the Marine’s inner turmoil. There is an unsubtlety to the sections of the score that take place in Falluah, but war is anything but subtle. A number of musical styles are assimilated into the 80-minute opera: from a Kurt Weill-like vamp, to rock and Middle Eastern music that add rhythmic vitality to the score. Yet for a story with so much drama and emotion, there is little in the writing that illuminates the characters. The story is reported. The fragmentary conceit of the storytelling leaves little room for expression. But on occasion these longed for moments do present themselves. Stokes’s score speaks persuasively in introspection; Lance Corporal Taylor singing of his daughter; a trio of Marines speaking to loved ones on the phone. But at its core Fallujah is the story of Shatha and Colleen, two mothers each desperately trying to save her son. It is for them that the composer writes his most fervent and inspired music. The music for Shatha in particular excites with its jagged rhythms and vocal pyrotechnics. The duet between these two women near the end of the opera is the work’s musical and emotional highpoint with both soprano voices soaring ever higher in despair: one mother dead and unable to prevent her son’s destruction; the other very much alive yet still powerless to connect. It is a moment of profound impact and provides the opera with its one true musical catharsis. That apotheosis is nearly attained again in Colleen’s closing aria, but the final release, a satisfying resolution is not to be for us. The opera ends quietly. We leave the theater bruised but hopeful. The 11-piece orchestra, under the direction of Kristof Van Grysperre, handles the various styles of the score commendably but would probably benefit from a larger performing space. Designers Hana S. Kim (video) and Dan Weingarten (lighting) do much with little. Director Andreas Mitisek does impressive work in extracting fully committed portrayals from his singers and maintaining clarity in the many shifting episodes of the opera, but even his best efforts can’t completely camouflage an occasional heavy-handedness in the writing. At the center of the cast is the commanding performance of LaMarcus Miller as Lance Corporal Philip Houston. Miller’s rich, resonant, and virile bass-baritone imbues Philip with a pent-up rage that threatens to explode at any moment. Jonathan Lacayo as Wissam convincingly conveys his character’s conflicted emotions and uses his naturally plangent tenor to heartbreaking effect in a lament over his mother’s dead body. As Shatha, American-Armenian soprano Ani Maldjian’s slightly astringent sound meets the demands of the part while portraying the fear and dignity of her character. In smaller roles Todd Strange makes the most of Lance Corporal Taylor’s aria and Arnold Livingston Geis’s bright tenor and sympathetic turn as the Corpsman make him a standout. Also noteworthy are Gregorio Gonzalez as Lalo, Jason Switzer as Rocks, and Zeffin Quinn Hollis as Kassim. However, it is Suzan Hanson’s Collen who leaves the greatest impression. From her entrance, Hanson brings an emotional honesty that even in her silence speaks louder than her son’s most vocal outbursts. Her large expressive soprano fills the intimate theater, but it is the visceral rawness of her portrayal that helps create the most fully realized character on stage. Her performance has heart. It has soul. It scorches.